Include a support email, resource link, and giving page for your volunteers directly in Volunteer by EverTrue at either the platform-level or the pool-level. Within the Volunteer application user menu, your institution can include a volunteer resource link and a support email for your volunteers to easily access. These links are global in that they will be the same links for any volunteer accessing the platform, no matter what pools they are a part of. Both links are available on the web and mobile app. To input a URL and email for these links, log into Console and navigate to Notifications. Enter the email* you'd like for support next to "Volunteer Support" and the resource URL you'd like to use next to "Volunteer Resources." *This email must be listed as a Console Admin. 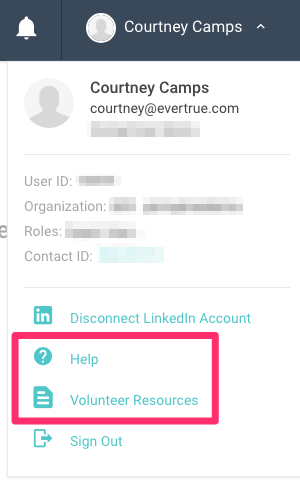 Contact genius@evertrue.com to add an Admin email at any time. We encourage all institutions to work directly with their volunteers in providing support. The institution should be the first-line of support and EverTrue will provide resources and training to the institution so that they can support their volunteers well. But as always, EverTrue is only an email away, and we are happy to assist a volunteer directly if needed. In the case that a volunteer needs direct assistance, please email genius@evertrue.com and cc the volunteer. For each pool, you can set a unique Giving Page URL and Resource URL, separate from the global Resource link above. This allows a Volunteer easy access to these links for each pool they are a part of. Think about creating a unique site and resource for Volunteers as they solicit for different initiatives. Go to your Pool Settings to input both the Giving Page URL and the Resource URL. Once set, these links will be available to the Volunteer in both the web and mobile app. On the web, click the menu button (three dots) next to the Pool Name to view the links and/or copy the URL. On mobile, open the pool and click the stacked dots in the upper-right corner. 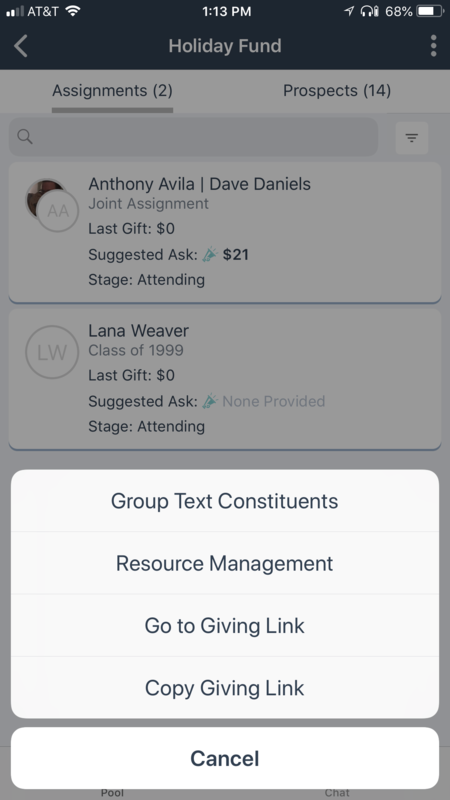 Within this menu, you have the option to view Resources, go to the Giving Link, or copy the Giving Link.